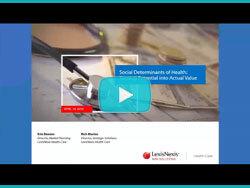 A brief recap of the webinar: “Social Determinants of Health: Turning Potential into Actual Value,” sponsored by LexisNexis Health Care, with Erin Benson, Director Market Planning and Rich Morino, Director, Strategic Solutions. This recap includes discussion of 5 categories of SDOH. Some states, insurers, and hospitals are already factoring social determinants into healthcare by doing things like ensuring patients have adequate housing and access to needed resources and programs. Freeman says more attention to social determinants would provide a more balanced approach to health. 3. Tertiary, treating the effects of a disease or illness. Considering diabetes as an example, primary care would include a focus on healthy lifestyle, secondary care would involve monitoring of blood levels and medication, and tertiary care could include amputation. Primary, secondary, and tertiary care can be targeted at the individual, interpersonal, organizational, community, or public policy level, Freeman says. Naloxone, a medication designed to rapidly reverse opioid overdose, for example, is tertiary care at an individual level. On the other hand, given that unemployment is thought to contribute to patterns of opioid use, a strategy of increasing job opportunities becomes primary care at a community level. By focusing on the social determinants, organizations can better address population health problems. Social determinants of health could impact how the healthcare industry conducts business. Instead of concentrating on tertiary care for patient populations only, healthcare could participate more in community health, Freeman says. Eventually, as social determinants of health become a greater part of the healthcare portfolio, tertiary care spending would decrease while quality of life would increase for affected communities. In many places, this has already begun, as hospitals and health insurers work with local health departments around community health concerns, she says. By law, providing community benefit has been central to the tax-exempt status of nonprofit hospitals. The ACA’s explicit requirement for nonprofit hospitals to consider input from those with public health expertise in the development of hospital community health needs assessment and implementation strategies has increased local collaborations around social determinants of health.